The walled discussion board almost feels normal at this point. As a tool, I can understand the use of a discussion board as a community builder and idea incubator. I’m a fan of those concepts. I’m still calling wangdoodles when discussion boards are utilized for awkward or inauthentic purposes, but I can see their usefulness as an archive of correspondences for an online community. On SLA’s MOODLE install, all community members have access to a discussion forum that’s been live since the first year – SLA Talk. New freshmen are part of the fold, and their thoughts intermingle with those of the first graduating class when they were freshmen. It’s readable, documented institutional memory. An observer is just as likely to find a thread discussing student language use in the hallways as they are to find a debate about the latest movie release. It is a simple artifact of community online. This semester, I’ve two courses implementing blogs as assignments. For one course, a few students are assigned each week to post their thoughts on the reading leading up to that week’s class. Each other student is required to reply to one post per week with the option of passing on one week during the semester. The posts have yet to be mentioned in class discussion. In the other course, each person is encouraged to post weekly. The posts’ content might be related to the readings or simply to the topic for the week. No replies are required, and the posts are weekly referenced by the professor in discussion. If blogging is to be required for a course, the latter instance comes closest to ideal practice – not required, but preferred; not for nothing, but tied to class. 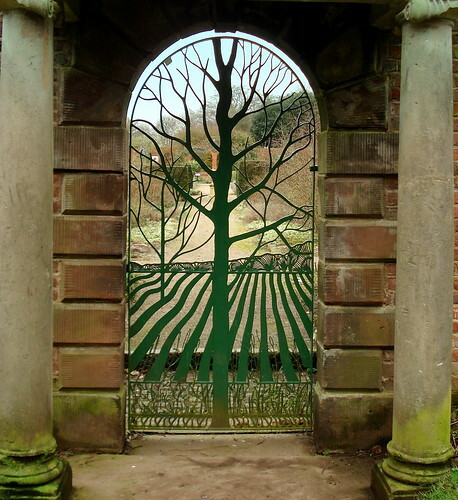 In both instances, our class blogs live within the walled garden. The thoughts with which my classmates and I play will never find footing in a feed reader or enjoy comments from those who have reading lists contrary those chosen for us on our syllabi. They should be public. Comments from anyone around the globe should be invited and commented. Our thoughts should mingle in the cyberether. One, the refinement of thinking benefits from a plurality of opinions, and the Internet offers a cacophony that would challenge us to sculpt our thinking in ways we could not imagine. Two, an open class blog asks participants to clear their throats and use their public voices while connected to a class setting in which they can find support when their voices are challenged. More than once, I’ve felt pushback when posting in this space. Early on, it was difficult to take. Sure, I wanted people to read what I posted, but how could they disagree with me? Opening our blogs would give my classmates and I the chance to write with the training wheels of a cohort of support while enriching the experience by exposing us to the democracy of thinking on the web. Walling a class blog runs the definite risk of students taking their opinions into the world untested and unprepared for criticism. It also robs them of the practice microphone a class blog could become. This post was originally published at autodizactic.com.